The Best Travel Acoustic Guitars in 2019 – reviewed here! The best travel acoustic guitar can do wonders for your musical career, especially if you earn a living as a performing musician or are planning to. And even if you simply want a guitar you can take along with you when you hop on a plane, train, bus or car, a portable travel guitar fits the bill. Travel-sized guitars are also ideal for players with smaller hands or a smaller stature, who may find full-sized acoustic guitars too large for them to hold and play comfortably. If you’re looking for a great travel guitar, here are some of the best. Yamaha SLG200S Silent Acoustic Travel Guitar You can tell Yamaha had fun designing the SLG200S, a travel-friendly acoustic without the usual acoustic guitar body. Part of the Silent Guitar Series, this model features a detachable frame and an all-new SRT preamp, which works very well to deliver a full-size experience and recreate the body resonance of an acoustic guitar. Portable, lightweight and eye-catching - perfect for gigs! 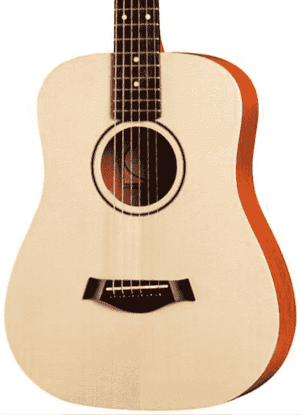 Baby Taylor BT1 Acoustic Travel Guitar The Baby Taylor BT1 is a dreadnought in 3/4 size, making it a powerful yet portable guitar that’s well-suited for traveling and for small hands - or for traveling small hands! It may be small, but thanks to its arched back, the BT1 produces a sound that’s bigger than similarly sized guitars. This little Taylor is super affordable too! Martin Backpacker Acoustic Travel Guitar The aptly named Backpacker from Martin makes our list of the best travel acoustics because of its eye-catching and unusual body shape, portability and unique sound - like a cross between a resonator guitar and a banjo. The 35-inch overall length makes the Martin Backpacker perfect for traveling - this is what the guitar is designed for, after all. Martin LX1E Acoustic Travel Guitar The Martin LX1E is an acoustic-electric guitar in travel-friendly package. 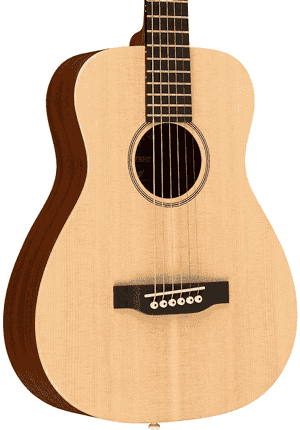 Also known as the Little Martin, compared with the Backpacker the LX1E has a more traditional dreadnought shape. It’s equipped with a Fishman Sonitone preamp system and features a solid Sitka spruce top. The HPL back and sides contributes to the guitar’s durability for worry-free playing as you travel. 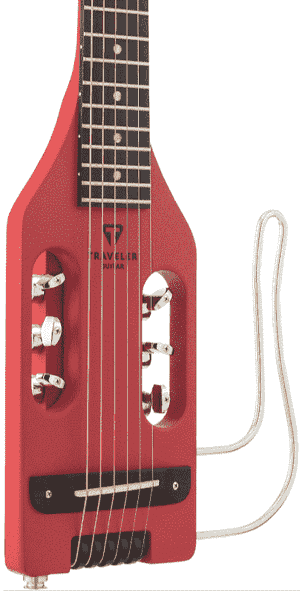 Traveler Guitar Ultra-Light Acoustic Travel Guitar The Traveler Guitar Ultra-Light has everything you need and nothing you don’t need in a travel guitar. It’s all been whittled down to the bare essentials. This extremely lightweight acoustic-electric travel guitar is sure to turn heads with its unusual design. The Ultra-Light has a full scale so you won’t have to wish you had smaller hands. Whoever came up with the idea to create silent guitars must have received complaints one too many times while practicing in the dead of the night. Whatever the circumstance, it’s a genius idea. Why should electric guitar players have all the fun playing with headphones on, right? The Yamaha SLG200S is the steel-string model in the brand’s Silent Guitar Series. It doesn’t have the soundbox of a traditional acoustic guitar, so there’s no audible sound coming out of it. Instead, it’s equipped with the SRT Powered pickup-preamp system and an output jack. The center portion of the Yamaha SLG200S is its body, made of mahogany. The neck is mahogany as well, and it’s topped with a rosewood fretboard. The detachable frame is made from rosewood and maple laminate. You may not get the natural acoustic resonance of a full-size acoustic, but if you want to practice without disturbing other folks around you can simply plug your headphones in. The design of the body also eliminates problems with feedback – a plus for musicians playing live. It also makes the SLG200S easy to bring along on trips or to the next bar. A custom compact gig bag is included for greater portability. Oh look at how compact this Taylor is! The Baby Taylor BT1 is a 3/4 size dreadnought that’s deemed to be one of the best travel acoustic guitars by musicians. Its small size also makes it an ideal instrument for kids – the Baby Taylor was actually initially designed to get kids started on the guitar. The BT1 Baby Taylor has a solid Sitka spruce top for a wide dynamic range and layered sapele back and sides for a crisp tone and added durability. Because it does have a traditional acoustic guitar body, it produces a natural resonance. The neck is a sturdy one made of tropical American mahogany, and topping it is an ebony fretboard. The Baby Taylor BT1 is purely acoustic, making it a top choice among acoustic purists or for folks who simply have no need for a pickup. This guitar is best for practicing at home, playing on the beach or around a campfire and improvising on the road. This Baby Taylor features X-bracing for maximum projection and resonance, so there’s nothing small about it in terms of sound. The included gig bag makes bringing this baby along on trips all the more easy and hassle-free. Over the years the Martin Backpacker has become the quintessential travel guitar. It set the standard of what a travel acoustic should be: small, light and easy to shove in airline overhead compartments. Aside from its portability, the Backpacker does offer a sound that’s adequate and suitable for travel and practice. The Backpacker by Martin has an oar-shaped body, making it stand out and leaving a lasting impression. The back and sides as well as the neck of the Backpacker are made from mahogany. The top is made of solid spruce and the fretboard is made of Richlite. It can get tricky to hold the guitar and keep it steady however, so a guitar strap is recommended for more comfortable playing. 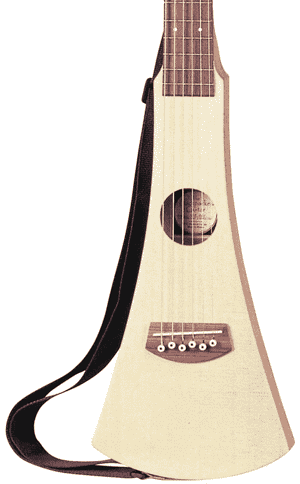 The Martin Steel-String Backpacker Guitar has a sound that can be likened to that of a banjo because of its size. Nevertheless, it produces a natural resonance that acoustic guitar players will appreciate. It doesn’t have the same projection as full-size guitars of course, but that’s not what the Backpacker was designed for, anyway. If you’re keen on getting yourself a well-built acoustic guitar for traveling or daily practice sessions, the Martin Backpacker is always ready to go. Another Martin that’s deemed to be one of the best travel acoustic guitars is the Martin LX1E Little Martin. It’s similar in specs to the LX1, the only difference being it’s fitted with electronics, a plus for gigging musicians on the go. The Martin LX1E has a pretty good projection for its size even when unplugged, so there’s no need to lug along a battery-powered amp when you’re going camping – unless it’s a pretty big area and you’re expected to perform for a horde of campers, of course. The LX1E Little Martin features a solid Sitka spruce top and mahogany-pattern high pressure laminate for its back and sides. The laminate makes the guitar less prone to warping due to changes in temperature and humidity, so you can say the LX1E is really a take-along-anywhere instrument. The neck of the LX1E is rust birch laminate and it’s topped with a Richlite fingerboard. The onboard electronics is made by Fishman, guaranteeing a solid plugged-in performance every time. Sound-wise, the Little Martin LX1E has the rich and deep sound of a Martin, albeit on a smaller scale. The Fishman Sonitone system helps in amplifying the sound and shaping the tone when necessary. Like the Yamaha SLG200S, the Traveler Guitar Ultra-Light is a silent guitar with no soundbox to speak of. And with the tuners integrated into the body, it doesn’t have a headstock either. This travel guitar looks odd at first, but when you consider why it’s stripped down, the design actually makes a lot of sense. At 28 inches long and with a weight of only 2 pounds 14 ounces, the Ultra-Light – without all the components usually found on an acoustic guitar (i.e. a soundboard, contoured sides, arched back, headstock, etc.) – is definitely lightweight and extremely compact. Basically it’s just a full-size neck with a tiny body, a bridge, a saddle and a pickup! It’s possibly the lightest and smallest full-scale travel guitar the world has ever seen. Oh, it does come with a detachable lap frame so you can rest it on your lap when you’re playing in a seated position. Neat! 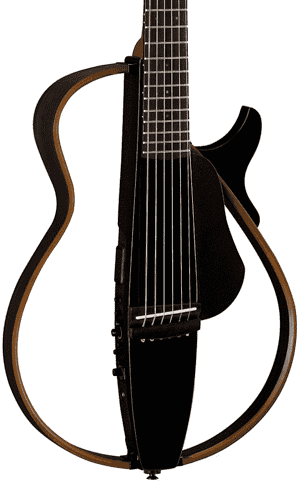 The Traveler Guitar Ultra-Light features a one-piece neck and body made of Eastern American hard maple and an ebonized rosewood fingerboard with 22 medium-size frets. There is an undersaddle piezo pickup and a standard 1/4-inch output so you can easily plug it into an amp. It’s never easy bringing along a full-sized acoustic guitar on a trip, especially if it involves riding a plane. There have been many horror stories of guitars being damaged in flight or ending up in another part of the planet because they were required to be checked in. While some airlines allow passengers to take their guitars with them as carry-on items, others don’t. Having to research which airlines to take can be a hassle, which is why many musicians prefer to bring along smaller guitars when traveling. But travel-sized guitars aren’t just for travel; they’re great all-around instruments too. You can use them for practicing around the house or for teaching a child the basics of playing a guitar. For “silent” models such as the Yamaha SLG200 and the Traveler Guitar Ultra-Light, you would need cables, amps and headphones to maximize their features, but all in all if guitar portability is your priority, these are some of the best you can get. If you’re still on the fence about travel guitars, or looking for reasons to justify buying one, here are the top benefits of having a compact, travel-friendly acoustic. Travel guitars by their very nature small and compact. Some models like the Traveler Guitar Ultra-Light and the Martin Backpacker even went a step further and changed their shape to be as small as possible, without compromising tone and a familiar playing feel on the neck and fretboard. Travel guitars take up little storage space, whether it’s at home, in a camping tent or while traveling in planes, cars or trains. Portability is always a plus. Being small and lightweight, travel guitars are extremely portable. And with them having their own specially designed gig bags, you’ll find no trouble carrying them by hand, slung over your shoulder or worn as a backpack. Even if you have to travel long distances – say, during a hike – the weight won’t make you fatigued. It’s easy to pick up and play. There’s something about travel guitars that make you want to pick them up and play. Perhaps it’s their size, which gives you the feeling that you’re more into having fun than doing a recital. This quality is beneficial for students, because this means they’ll spend more time practicing. On the same note, having a travel guitar enables you to be productive while waiting. Imagine how much time you spend waiting for your flight, in a traffic jam, sitting out a power outage, waiting for your friends and all sorts of occasions where you’re just doing nothing. Playing your favorite tunes, practicing improvisations and writing your own songs on a small guitar would be the perfect activities to occupy your time. It’s always good to have one in your collection. If you have been playing guitar for a while and already have a number of models in your collection, a small-bodied guitar is always nice to have as part of your arsenal. For many musicians, it’s actually a must to have a travel guitar, something they would feel more at ease with when going places. It’s common to worry about taking a prized acoustic along on a trip, more so if there’s a plane flight involved. Even the most hardy of hard cases are no match for really bad handling, so a favorite guitar can still get damaged or worse, lost forever. When you have a travel guitar, you won’t have to worry about its safety too much, as you would be able to have it with you at all times. Take note of the guitar’s limitations and manage your expectations accordingly. A guitar with a smaller body will obviously have less volume and resonance, a thinner tone and may require a number of accessories for a bigger sound. Be aware of what a particular travel guitar offers in terms of sound, build and playability. Consider what it can and cannot do. Watch demo videos and read reviews to see what other musicians think and to help you determine if it would be a right fit for you. Hopefully you’ll find what you’re looking for in this list of highly recommended travel acoustic guitars!